Program Evaluation in Social Research presents a plan for developing evaluation into a form of applied social research that is not only methodologically sound, but also relevant to the problems of society and built on a technological (as opposed to a scientific) model. This book views evaluation as applied, relevant social research and as social technology and assesses its validity and usefulness. 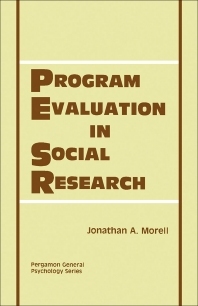 This monograph is comprised of eight chapters and begins with an assessment of the consequences of program evaluation for the conduct of social research and for society at large, and how evaluation can be made into a method of generating practical and powerful suggestions for planning successful social programs. The concept of ""outcome evaluation"" is also organized into meaningful categories which can be used for the intelligent planning of appropriate evaluation activities. The reader is then introduced to the types of evaluation that are carried out, the relative merits of each type, and how to optimize the validity and utility of each type. Evaluation as a technological, rather than a scientific, pursuit is also discussed. The remaining chapters focus on the frictions that arise during the implementation of program evaluation; program evaluation as a profession; and how evaluation can be developed into a relevant and powerful method of guiding the course of social innovations. This text will be a useful resource for sociologists, social scientists, and social researchers.